If you are a metalworker, discover the best welding gloves because welding is one of the hazardous operations that you can undertake. While the super bright light can damage your eyesight, the high-heat welding torch can cause grave injury to your hands and other parts of your arms. The fact that you should be well protected cannot be overemphasized. In fact, government authorities require companies and businesses involved in welding as well as individual welders to have appropriate welding protective apparel at all times. Failure to do so, the specific organization can face penalties including fines, revocation of licenses and even suspension. 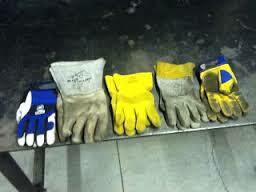 As different welding situations involve different levels of heat, there are diverse welding gloves to suit your needs. In this regard, discover the best glove material for your kind of welding. Among other safety apparel, invest in the best welding gloves today and avoid getting in trouble with the law. More importantly, weld your way to business success without worry of injury occasioned by flying welding sparks and hot metal spatter. This is one of the best welding gloves in the metal fabrication industry. If you can lay your hands on a pair, the sooner you buy it, the better for you. 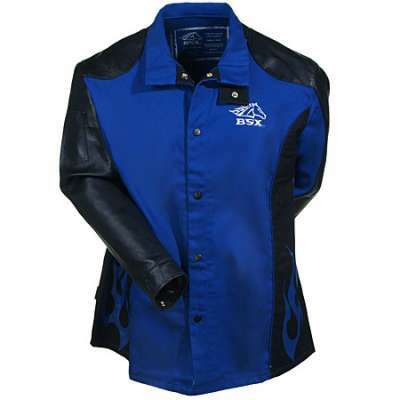 It is made of high quality leather material to shield your hands from the rigors of metal fabrication. In addition, the gloves are stitched at the seams for extra strength. You will fall in love with the cotton-lined interior, as it offers unrivaled comfort. In fact, you can work with your hands tucked safely in the gloves the whole day. This reality is accentuated by the fact that a pair weighs only 11.2 ounces and measure 13 inches in length, 5.5 inches in width and 0.5 inches in thickness. Since your hands are prone to ultraviolet rays and molten metal, the US Forge 400 gloves feature several layers of different leather grades. While the internal liner provides comfort, the exterior is a tough heat resistant leather padding. If you hate severe skin burns, invest in a pair right away. As a seasoned welder and plasma cutter enthusiast, take your personal safety during metal fabrication to the next level with the Steiner 21918 welding gloves. This attractive brown Y series of gloves measure 18 inches in length. They have a slit at the end to accommodate your shoulders. Each pair is made with tough cowhide leather for a unique mix of advantages-durability, hand dexterity, comfort and resistance to abrasion. The gloves boast of a reinforced thumb strap, comfortable full cotton lining, and foam-insulated back. Since they weigh just one pound, you will have no trouble working in them for long hours. Apart from welding gloves, Steiner Industries has been manufacturing and supplying protective clothing for welders and industrial partitions designed like curtains. Most industry regulators approve their products for use in arguably all metal fabrication environments. This is another product manufactured by US Forge. Unlike its 400 counterpart, the 403 boasts of longer gloves that cover your entire arm. Just like the shorter variety, the Extra Length welding gloves are deluxe lined. Similarly, their construction guarantees comfort and flexibility. They are made of the softest yet heat resistance grade of leather. The internal liner provides your arms with comfort and warmth. At the same time, the exterior features extra reinforcement in friction areas to avoid wear and tear. The only deterrent may be the fact that the welding gloves weigh 13 pounds. While this is not a big drawback, invest in these extra long gloves for maximum safety. In addition to the heavy-duty leather that used to make the gloves, the thumb of the Lincoln Electric Traditional welding glove is padded for extra strength. You will fall in love with the sense of fashion created by the black split leather with a red flame pattern. If you are looking for improved finger sensitivity, purchase a pair from Lincoln Electrical. These safety apparels are among the best welding gloves as they boast of Kevlar Stitching system whose welted seams offer unrivaled durability. Their meager 14.4 ounces ensure you do not have to deal with too much weight. 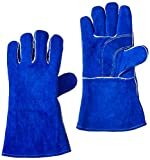 As the gloves are heat and flame resistant, you may be tempted to use them in a multi-faceted kitchen!